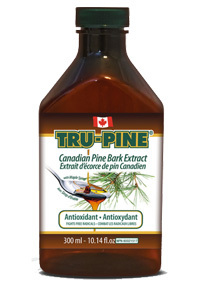 TRU-PINE® is a premium quality liquid extract made of pure Canadian Pine Bark Extract (Pinus Strobus) with a great maple syrup taste. Its unique extraction process ensures consistent quality in every teaspoon. TRU-PINE® is gluten free. TRU-PINE® is blended and bottled in a cGMP (good manufacturing practice) certified manufacturing facility. All employees are required to wear protective head, body and footwear gear. All ingredients in TRU-PINE® are submitted to quality control tests, including high performance liquid chromatography, near-infrared spectrometry and microbiological analysis. The technology developed to produce TRU-PINE Original Canadian Pine Bark Extract was researched and developed by Agriculture and Agri-Food Canada, resulting in a uniquely balanced pine bark formula and a state of the art extraction process. Distilled water,maple sugar,citric acid,potassium sorbate,sodium benzoate. Gluten, lactose and yeast - free. Non- irradiated. Take 1-2 teaspoons, 2 times per day. Consult a health care professional for use beyond 3 month. Do not use if pregrant or breastfeeding. Do not use if safety seal under the cap is broken or missing. Keep out of reach of children.